One word – sublime! There are such breath-taking flavours in this lamb kofta dish that I find it hard to do justice to it with words alone. But while it’s massively tasty, it’s also low in calories. The spices do the talking in this dish. I’m sometimes lazy and use ground spices when cooking. Ground spices deteriorate much quicker than whole spices – you do get more flavour from grinding whole spices. For this dish, I use mostly whole spices that I dry-roast first and then grind to a powder using a pestle and mortar. The correct way would probably be to dry-roast each spice separately but there are limits to my patience. There was a time when I was considering starting a food outlet serving nothing but different types of meatballs (see Spanish-Style meatballs). 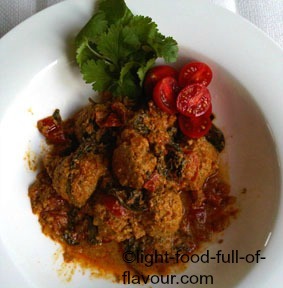 These lamb kofta would have been my Indian version. 1. To make the kofta, start by finely grating the red onion (you want a moist mush) into a bowl. Add the grated fresh ginger, the crushed garlic, chopped chilli, the egg and season well with salt and pepper. Give it all a stir, add the lamb mince and mix thoroughly. 2. Have a tray that will fit in your fridge ready. Wet your hands with cold water and form the mixture into 20 meatballs. Place the meatballs on the tray, cover with cling film and place the tray in the fridge. 3. For the tomato sauce, start by dry-frying the coriander (cilantro) seeds, the cumin seeds, the cloves and cardamom seeds in a frying pan over a medium heat, stirring, for 1-2 minutes until the spices start to become aromatic and a few shades darker. Place the roasted spices in a pestle and mortar and grind to a reasonably fine powder. Mix in the ground cinnamon. 4. Heat the oil in a large sauce pan or casserole dish, add the chopped onion and fry over a medium heat, stirring every now and then, for 5 minutes. Add the spices and continue to stir and fry for 30 seconds before adding the chopped tomatoes. Continue to stir and fry for another 5-7 minutes until the tomatoes have collapsed. Add the water, then the yogurt and stir. Season with salt and pepper and bring the sauce to a simmer. Taste and check the seasoning. 5. Carefully slide in the chilled meatballs into the sauce. Bring it all back to a simmer, cover with a lid and simmer gently for 20 minutes. Take off the lid, carefully turn the meatballs over, and continue to simmer without the lid for a further 10 minutes. At the end, add the spinach and carefully stir it in until it has wilted. I like to serve this lamb kofta dish with steamed green beans and my Asian-style carrot salad. For an even more substantial meal, serve it with roasted butternut squash and/or sweet potato.